I now have a grasp of making slight adjustments to code and uploading code to my board. Now that I have a little taste, I want more, so I imagined a simple idea to go a step beyond the tutorials and example codes. An interesting thing to me about coding is how the process is not linear, like what can often happen in other design fields. I can start layering in code and then make a little game of optimizing that code for editing, total number of executions, or number of lines, for instance. In fact, speaking of games, I am a fan. And there are many games available online for learning code in many different languages. Although I did not have much time to explore them all, I will probably come back to some in my free time. One multiplatform (including iOS) game: Human Resource Machine helped prime my brain for thinking code. The diffculty ramps up nicely (which translates into increasingly challenging coding) and it was fun! 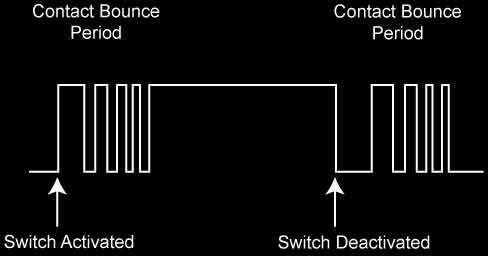 Next, I dove into this tutorial to learn about using a switch, which was absent up to this point, Pulse Width Modulation (PWM) and compensating for switch bouncing (more on these later). When the button is pressed, there may be some bouncing that occurs within. These are tiny parts and the bouncing may only occur over fractions of a second. To the MCU, however, that might be what we perceive as days. This diagram shows the effect. Your code can include a configurable delay in reading the switch to bypass the bouncing period after pressing it. From Arduino: "Pulse Width Modulation, or PWM, is a technique for getting analog results with digital means. Digital control is used to create a square wave, a signal switched between on and off." I went back to the ATtiny datasheet and sure enough, Pin 6, the location of my LED, has PWM. I started by following along with the tutorial with some small mods. I think it is good to get a sense of how my process of building a code happens, so I will show some steps. Not interested? Skip to the bottom of this section. This first sketch turns on the LED when the switch is engaged and off when it is released. The next iteration changed the action to flipping the LED on and off with button presses, like a light switch. Here, you can see a couple of booleans are added. A boolean holds one of two values, ie. true or false. In the loop, if the switch is pressed which is verfied against the previous switch state, then flip the ledState (this is the function of the ! mark) and then change the lastSwitch back to high to reset the conditions for the if / else statement. And write the change to the ledState, change it to true for on, false for off. This iteration adds a debounce boolean to negate signal noise in the button presses. Basically, if the button state seems to change, wait a moment and verify the change. Adjust the delay according to its effectiveness. Then the loop incorporates the debounce boolean. This version drops the ledState boolean, for an analog brightness. Everytime the button is pressed, the brightness of the light increases slightly. Until, that brightness number exceeds 255, when it is set back to 0 (off). That is the PWM at work. I started trying to get the light to go through a series of brightness changes each time the button was pressed (rather than one change per press, several changes per press). After some trial and error, I moved the analogWrite function into the if statement, added some delays and went to work. This time with each button press the light turns off and then slowly increases in brightness up to full brightness and remains on. So I started to look around for a (my words) repeat something until something command. For that, I found the while statement. While the light is powered lower than my ledMax integar, add power at my timing. Once the ledMax is surpassed, reduce the power to zero at my timing. It is more convenient for me to ask the chip to find its own ledMax based on the ledChange interval. It mostly works, but sometimes the light flickers at its brightest. Because, I was using poor math. I made some adjustments to the ledMax integar and it seems to be working now. Press the switch, and the light ramps up and ramps back down according to a specified timing and change interval. Then for fun, I removed the switch functionality completely for a more lifelike blinking sketch. It could be fun to see if I can make the breathing like function turn on with the switch and off without and/ or to add some math induced variables to the change and timing intervals to make it even more wild. Arduino: Buttons, PWM, and Functions : YouTube tutorial by Jeremy Blum. Human Resource Machine : One of many games to help learn code logic or language.